The Harvard women’s tennis team demonstrated its dominance in the three-day Bulldog Invitational at Yale over the weekend. Freshman Rachel Lim, freshman Rachel Eason, freshman Chelsea Williams, freshman Annika Bassey, sophomore Neha Gupta, sophomore Anna Li, junior Lexi Milunovich, and junior Natasha Gonzalez competed in the weekend's tournament against Dartmouth (Sunday), Boston College (Saturday), and Cornell (Friday). The team steamrolled over all of its opponents on the weekend, winning all matches as a team. The tournament serves as an early opportunity for the team to play strong teams in the offseason. Natasha Gonzalez emphasized how awesome it was to see all of the freshmen performing at high levels and keeping up the intensity. Sunday’s record proved to be the worst of the weekend, yet the Crimson still managed to be too much to handle for the Big Green. Harvard won three singles matches and two doubles matches and lost two singles matches and one doubles match against Dartmouth. After losing the first set 6-3, Anna Li refused to back down, and was able to capture the second set 6-3. Once the playing field was even, Li took control and the win, defeating freshman Jingyi Peng in the third set, 6-3. Neha Gupta fought all the way to a seven-point tiebreaker in the first set of her match, and came in clutch with a 7-3 win. Carrying that momentum into the second set, Gupta was able to secure the match in straight sets, defeating senior Madison Hwang. 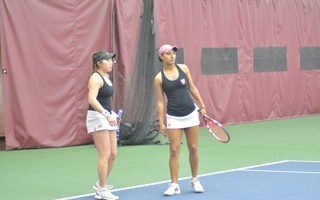 Li and Gupta then joined forces in a doubles match where they demolished the Big Green 6-0. 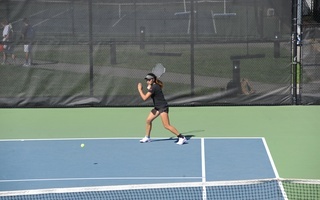 Singles victories also came from freshman Rachel Eason and Lexi Milunovich, both of whom won in straight sets. Rachel Lim fell to senior Abigail Chiu in her singles match, but bounced back and forced Dartmouth to roll the bagel in her doubles match with partner, Chelsea Williams. The Harvard-Boston College match was similar: Crimson 8, Eagles 2. Singles won six out of the seven courts and doubles took two out of three courts. Three matches included a seven-point tiebreaker. Eason and Lim both won their first sets seemingly easily, but both second sets proved to be a bigger challenge, ending in tiebreakers. However, both were able to get the win, edging their opponents with identical tiebreak scores, 8-6. Gonzalez lost a tight first set to freshman Laura Lopez, 4-6, but had the intense mental strength to bring the second set to a tiebreaker. Lopez was able to seal the win, however, beating Gonzalez with a tiebreak score of 8-6. In last year’s invitational, Boston College earned a strong 6-1 victory over H, but clearly the tables have turned. The first match of the tournament was against Cornell, and Harvard was fired up. The Crimson came out of the gates firing on all cylinders. The competition was not strong enough to defeat Milunovich, however, as she defeated the Big Red Maria Adiaconitei, 7-6(4), 6-1. Milunovich claimed a huge shift in momentum for her was winning the tiebreak in the first set. Clearly she entered the second set with all of the momentum, and it never shifted again. For the team as a whole, Gonzalez believed it was the Cornell match that set them up for success for the weekend. The Crimson remained unbeaten in conference play with a pair of 4-3 wins, edging out Brown on Friday indoors in Providence before topping archrival Yale outside at the Beren Tennis Center two days later. Facing off against Middlebury, Seton Hall, and the University of Rhode Island, over the weekend, the Harvard women’s tennis team dominated its opponents across the board at home in the Beren Tennis Center during the Harvard Fall Scramble.